Durham University research has been assessed as "world-leading" across the sciences, social sciences, and arts and humanities in a national exercise to determine the quality of research in UK universities. The Research Excellence Framework (REF 2014) measured the quality and impact of research submitted by UK universities across all disciplines. The University’s research breadth and power was demonstrated in a submission of more than three-quarters of staff from all three faculties across 22 Units of Assessment (subjects). 83 per cent of Durham’s research was assessed as "internationally excellent quality" or "world-leading", that is, either 3* or 4*. Overall, 98 per cent of Durham University research was assessed as international quality, or 4*+3*+2*. The University’s research environment was found to be of international quality across the board, and 98 per cent of it was assessed as "internationally excellent" or "world-leading" (3*+4*). One of the new assessment criteria introduced for REF 2014 was the wider societal impact of university research. Durham submitted 89 'impact case studies' where research had translated into real-life applications with broad benefits to society, the economy, politics and the environment. Over 90 per cent of case studies were graded 3* and 4* - as having "outstanding" or "very considerable" impacts in terms of their reach and significance. 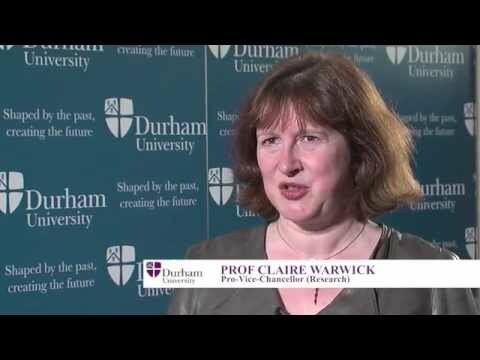 REF 2014 identified world-leading research in every Durham University subject. More than 25 per cent of the Durham University subjects entered for REF 2014 were in the top 5 subjects nationally for grade point average (overall score). Areas of particular strength include Anthropology, Archaeology, Chemistry, Classics, Education, English, Law, Music, Physics and Theology. Research Assessment Exercise, the previous system for assessing the quality of research in UK higher education institutions. The last one was in 2008. A submission is all of the data and information submitted by one HEI under one UOA. There were 1,911 submissions. The Grade Point Average (GPA) is an internationally recognised calculation used to find the average result of all grades achieved.